To review the literature and update the current guidelines of alternative/natural agents, cryotherapy, and/or laser therapy in the management of alimentary mucositis (AM). The original guidelines developed by the Multinational Association for Supportive Care in Cancer (MASCC)/International Society for Oral Oncology (ISOO) mucositis study group were the basis for this study. A medical librarian conducted an initial Medline search to identify research articles published between 2002 and 2005 in English language. A search term combination that included stomatitis, mucositis, mucous membrane, neoplasm, lasers, complimentary therapies, amino acids, antioxidants, vitamins, minerals, plant extracts, and cryotherapy was conducted. This initial search identified articles with a strong scientific methodology that included both preclinical and clinical research. Using standardized scoring forms, authors reviewed and scored individual articles. A consensus result of the review was achieved in a meeting of reviewers in June of 2005. The initial search identified a total of 167 new articles. Of these, 14 were selected and reviewed: alternative/natural therapy (one preclinical study); cryotherapy (four clinical studies); lasers (two clinical studies); and alternative/natural agents (seven clinical studies). A new guideline could be established for the use of cryotherapy in the management of AM in hematopoietic stem cell transplant (HSCT) patients receiving melphalan in the conditioning phase. The rapid progress in the understanding of AM created a need for new prevention and management protocols. 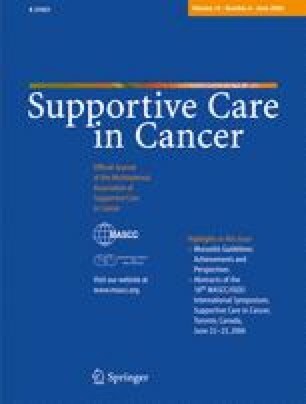 Frequent literature review is now necessary to identify agents and protocols being developed in this important area of supportive care in cancer.